With the next post I'll return to my normal, semi-serious self. Right now, I'm eating lots of steamed veggies, Greek yogurt, roasted chicken, and salty nuts (girl's gotta live, ya know) and taking a brief baking hiatus. So, until then, I leave you with another food personality test. (Before reading, remember to insert tongue firmly in cheek and adhere it to the side of your mouth with peanut butter and take my peanut butter personality test, if you haven't already). What was your cereal personality as a kid? Directions: Ask yourself, what was your FAVORITE cereal as a kid? Not the one you ate the most, but the one which you begged for incessantly as a child. I can't make an exhaustive list of every cereal ever created, but of these, which one resembles your favorite the closest? You were a sensitive, artistic and wounded soul. You were thin and liked to draw as a kid, growing up. You ate lots of fruit, including the fruit in your cereal. You may have had some food issues and did stuff like bring peanut butter and saltines to a video game party in the 80s, because you didn't like pizza. You may be a vegetarian now, or at least you don't like meat that much and prefer sushi. 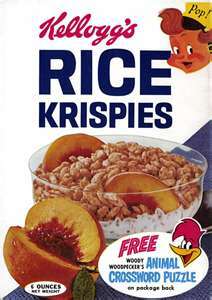 Your intellectual bent is shown in the illustration--Rice Krispies always had pretty crappy prizes, but then again, you could make dessert out of it. 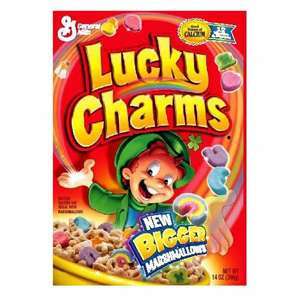 Everyone knows that Lucky Charms is simply an excuse to eat candy for breakfast. You have serious self-control issues around food. You probably did some kind of illegal drug in college. You're probably an investment banker or work in sales. You drink a lot of coffee and eat fast food but you're spazzing out so much all the time it probably doesn't make you fat. You still eat this stuff, but with skim rather than whole milk. You're probably older than the average person reading this quiz and kind of stuffy when it comes to food. You like roasted chicken, mashed potatoes, and peas for dinner. You might even still eat your cereal with whole milk. That's okay, because it's a little-known fact by people in the 21st century that corn flakes with sugar and whole milk tastes pretty much like dessert. 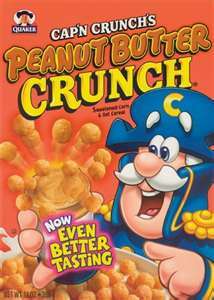 You loved the taste of this cereal as a kid, unlike the other kids who just begged for their cereals because of the cartoon characters on the front. You're kind of a hippie, but not really. You like carrot cake with half an inch of cream cheese frosting, and tell yourself it's healthy. Not only did this cereal taste awesome, but it also had great prizes and commercials. Once, you poured real honey on it. That was SO good. Sometimes, when you eat it today, you start to eat it straight from the box and can't stop. You had a surprising amount of self-control as a child, It's fun to pick out the differently-colored nuggets and eat them in order, and unlike Lucky Charms all of the cereal actually tastes pretty good to a kid--i.e., like pure refined sugar. Today, you don't eat this stuff (what adult can, given the cereal's glycemic index) and are probably a pretty good cook. You're especially good at chopping things and baking. 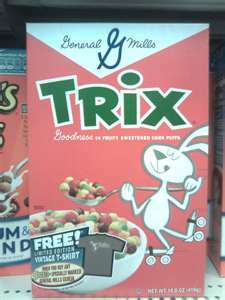 You still feel a pang of pity for the Trixx Rabbit. But he probably is better off just having carrots and leaving the cereal to the kids. This cereal tastes like sugary awesomeness and contains candy. It only lacks the delight of differently-colored marshmallows like Lucky Charms. If you were allowed to eat this stuff on a regular basis, you grew up with parents that allowed the coolest junk food ever in the house. You had brown sugar Pop Tarts, Double Stuff Oreos, and could eat frosting out of the can and no one would care. Today, you might be a foodie, but more of the kind who can makes some mean BBQ than someone who cooks with different kinds of vinegar. You probably don't live in a big city. You tend to buy things based on superficial packaging, rather than what is inside. You've had some really bad relationships in your life. Your parents found it easier to give you everything you wanted, like a bowl full of mediocre chocolate chips in cereal, than persuade you to try new things. The prizes in this cereal were always great (stuff that made noise, Hershey Bars, McDonald's coupons) but the cereal itself, even to the palate of a five-year-old, was forgettable. Your parents weren't there for you when you were growing up--you came from a big family, had a difficult sibling, or they drank. Or all three. 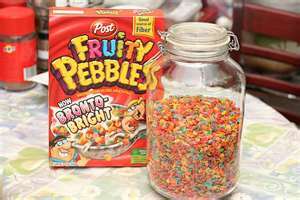 That's why they bought you cereal so sugary the spoon could stand in the multicolored milk after you ate it all. You've been in therapy at some point. Nobody likes Apple Jacks best. If you did, you were one of those weird kids who would pour apple juice or orange juice in his cereal or drink cereal milk with a straw. You were really boring as a kid, the kind of kid who was satisfied getting raisins as 'dessert' his his lunch box. You were too close to your mother and it became an issue in later relationships. Otherwise known just as 'crack.' Insanely delicious, pseudo-healthy cereal with twice as many calories as other cereals. You had a highly developed palate, even as a child, and loved sharp cheeses, pungent meats and spices, and weren't afraid of exotic ethnic foods. Your cardiologist hates you. Sometimes, late at night, you get the urge to eat peanut butter straight from the jar while having a peanut butter sandwich slathered with honey, bananas and bacon. You like older men and have some father figure issues. Full disclosure: I no longer eat cereal, and prefer Greek yogurt every morning. However, as a kid, I did in fact eat all of these cereals at least once. @Adam--I thought that Wheatabix would be the first cereal people would complain that I left out (when I lived in the UK, I knew some die-hard fans and they would get quite passionate about using warm versus cold milk on the cereal, too). Chex (the American incarnation) /Shreddies are in the 'grown-up' cereal category to some extent, so you can congratulate yourself on having a highly- evolved palate at a young age. As a kid, I LOVED Raisin Bran...but also Frosted Flakes..
We never had sugary cereal in my house growing up. Corn Flakes or Kellogg's (but never Post) Raisin Bran and the occasional box of Rice Krispies. I did once convince my dad to buy a box of Boo Berry when we were on vacation, but it was so disgusting it cured me of ever wanting a fun cereal forever. Although really, I'm not even sure when we allegedly ate cereal, as we had bacon and eggs for breakfast every single morning. 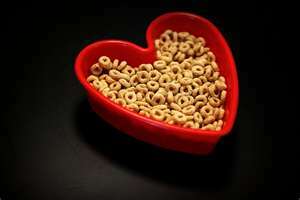 This is why no matter how many whole grains I eat now, my cholesterol will never go below 200. @flurrious--I vaguely remember eating Boo Berry and finding it repellent and artificial, even as a child. However, I had it after getting addicted to many, many fun cereals. In the hierarchy of breakfasts, cereal was certainly not No.1. No.1 was Perkins pancakes (or any pancakes), followed by waffles, cinnamon toast, bacon or Sizzle Lean, French toast, and only then sugary cereal. I think eggs are a pretty healthy breakfast, actually. Don't worry about the cholesterol numbers--they keep lowering the 'normal' range to sell more statins. What about Frosted Flakes?? 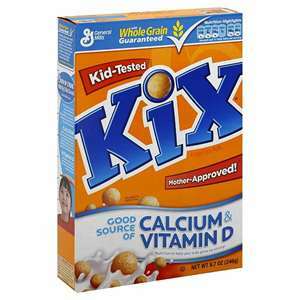 Those were always my favorite, and they are always what I reach for when I want "kid's cereal" as a guilty pleasure. I guess they are just like Corn Flakes with sugar but it's a much more even coating and it has Tony the Tiger. But I don't buy cereal that much because a box costs like $5 at a New York deli. There is a certain beauty to the innocence of childhood where cereal is priced in 1979 dollars and paid for by someone else. I LOVE these tests. 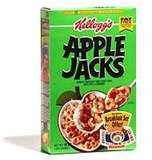 Apple Jacks and Golden Graphams were my favorite....I'm the weird kid! @Mother Duck--Based on comments from email and Facebooks, I did a disservice not listing Frosted Flakes. 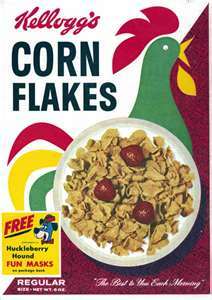 Come to think of it, I LOVED them as well--I guess I did deploy the logic that they were corn flakes with added sugar, but there is something special about the evenness of the coating and the way it slowly sugars the milk. Frosted Flakes=best cereal milk ever. And somehow cereals did taste better with the cool boxes, plastic toys, and lack of a need to actually purchase said cereal. @The Blonde Duck--I am so glad you like the quizzes! 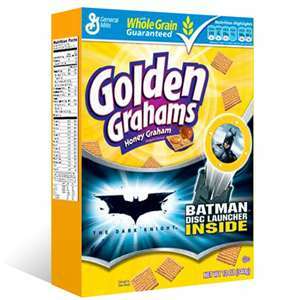 Golden Grahams were one of my favorites as well (and truly the best prizes)--I didn't dislike Apple Jacks, exactly, but they are kind of weird. But that's okay! 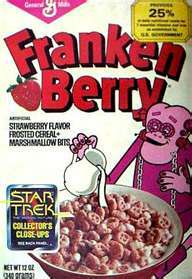 I ate all these cereals growing up, but the one I found most fascinating and which I begged for was Frankenberry. When I finally got it, I ended up not liking it very much so I guess your assessment only partially applies. The one my mom bought which I thought I'd hate was the Cracklin' Oat Bran, of course! 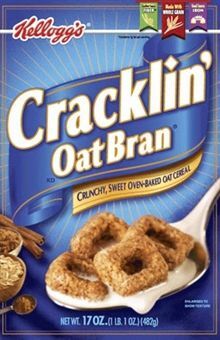 To clarify (because I messed up my comment), I loved the Cracklin' Oat Bran. @Anna--I had a similar experience with Frankenberry. Because it was pink, I longed, longed for a box, ate it, and wasn't that fond of the fake strawberry taste. I kept eating it though, because it was pink. Cracklin' Oat Bran doesn't look like much, but it is INSANELY good. I wish it was as healthy as it looked! Enjoyed this post! Glad you mentioned frosted flakes in your reply..Tony the Tiger was my favorite..I'm probably a little older than your average reader! Followed next by Captain Crunch. Yup, now I gravitate to the bran cereals!!! My fav now is Fiber One Honey clusters. @Baking Ribbons--Thanks for commenting! I should probably do another 'cereal personality test' involving 'cereals you eat now!' Or another test to cover the ones I left out, including Frosted Flakes!